Artist Projects (2012-present) are open access, courtesy Duke University Press. NANCY SPERO WAS BORN IN CLEVELAND, OHIO, IN 1926 AND RECEIVED A BFA FROM THE SCHOOL OF THE ART INSTITUTE OF CHICAGO IN 1949. AS A FEMINIST ARTIST AND ACTIVIST, NANCY SPERO’S CAREER HAS SPANNED FIFTY YEARS. SHE WAS A FOUNDING MEMBER OF THE WOMEN’S COOPERATIVE A.I.R. GALLERY IN NEW YORK CITY’S SOHO DISTRICT IN 1971. HER CONTINUOUS ENGAGEMENT WITH CONTEMPORARY POLITICAL, SOCIAL, AND CULTURAL CONCERNS IS RENOWNED. DEBORAH FRIZZELL IS ASSISTANT PROFESSOR OF ART HISTORY AT WILLIAM PATERSON UNIVERSITY IN NEW JERSEY (USA). 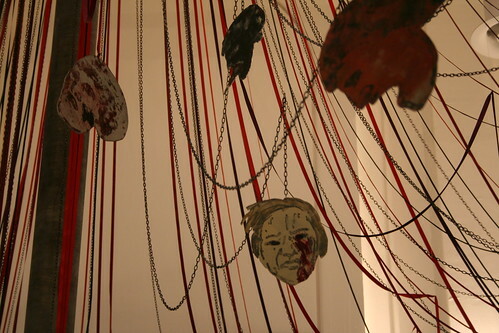 IN JUNE 2007, SHE ACCOMPANIED NANCY SPERO’S ASSISTANTS, SAMM KUNCE AND MARY-BETH GREGG, TO VENICE TO DOCUMENT THE INSTALLATION, MAYPOLE/TAKE NO PRISONERS, IN THE ITALIAN PAVILION OF THE 52ND VENICE BIENNALE, CURATED BY ROBERT STORR. Nancy Spero’s studio comprises the entire floor of a loft in Greenwich Village, a deep space divided only by a partition that once separated her working space from that of her late husband’s, the painter Leon Golub (1922-2004). As I entered Spero’s studio to see what she was working on for the upcoming Venice Biennale, I glimpsed the borderline defining her space and Leon’s old painting space which had remained empty since his death in August 2004, except for the looming presence of his mural-scale painting, Gigantomachy II (1965). Nailed into the brick wall, the scarred raw linen surface of Gigantomachy II seethes with a tangle of brutish, wretched bodies, Olympian gods and giants, battling to the death for dominance.